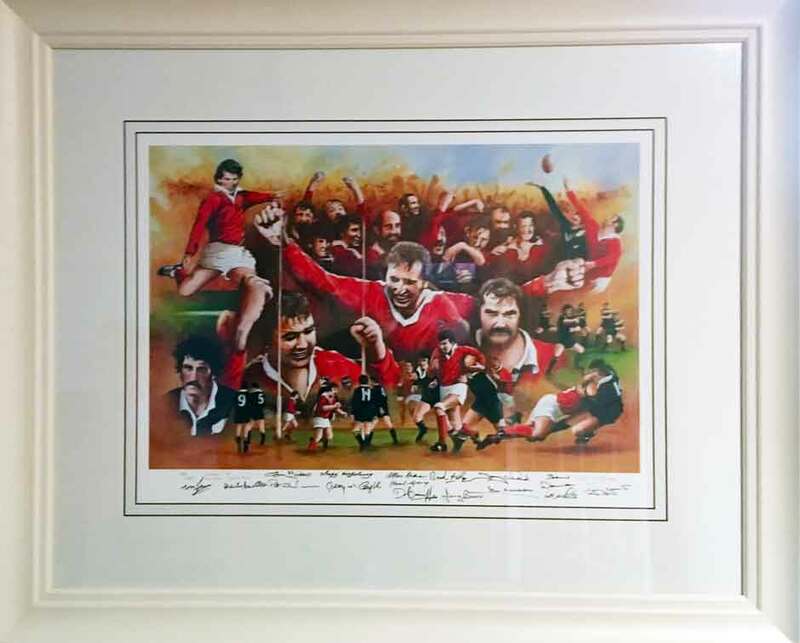 Munster rugby had a famous victory over the mighty All Blacks in Thomond Park on October 31st in 1978, and was the first time that the Kiwis were beaten by an Irish Senior men’s side. The Irish International side scored their first ever victory over them in Chicago in 2016, and our Ladies side have also been successful over their Ladies International ‘Black Ferns’ side. With a team coached by the legendary Tom Kiernan, the ’78 Munster side included Larry Moloney, Moss Finn, Jimmy Bowen, Seamus Dennison, Greg Barrett, Tony Ward, Donal Canniffe, Gerry McLoughlin, Les White, Pat Whelan, Brendan Foley, Moss Keane, Colm Tucker, Christy Cantillon, and Donal Spring. 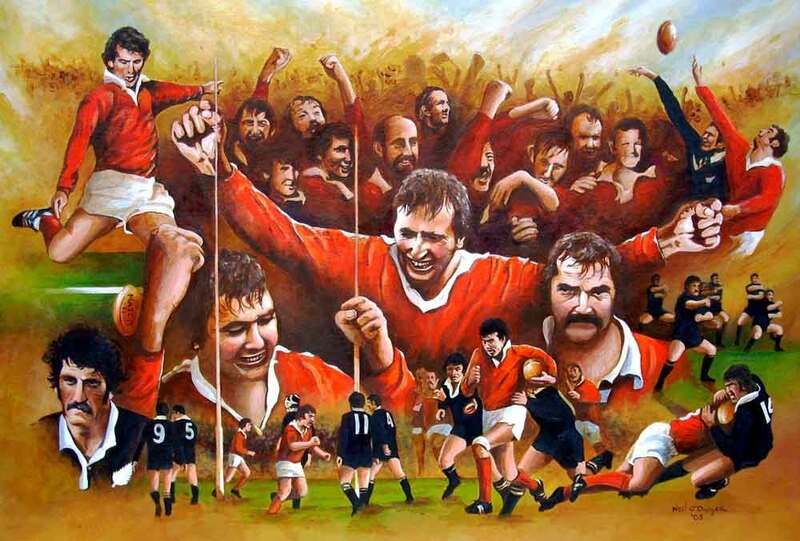 The heroics from this game will always be remembered by rugby fans in Munster and all over Ireland. It has inspired a West End play, a best-selling book and spawned a rugby religion in red. In 2008, I did a painting celebrating the 30th anniversary of that unique achievement, from which I produced Limited Edition Prints. In 2009, I travelled and met every one of the players in the privacy of their homes etc, and all kindly signed a small number of my Prints for me. Meeting and chatting with these men individually in relaxed surroundings, was a thrill of a lifetime, and something that will stay with me always. The final signature obtained was that of Les White in Portsmouth in November 2009. Since then, Moss Keane and Colm Tucker have sadly passed away, RIP. The central image shows the celebrating Moss Keane, flanked by try scorer Christy Cantillon, with Les White on his other side. Tony Ward, who converted the try, and kicked two drop goals on the day, also features. Brendan Foley is also shown in the lineout against the All Blacks Andy Haden. The legendary Kiwi Captain, Graham Mourie, can be seen in the lower left hand corner. Moving across left to right shows Pat Whelan turning to celebrate Cantillon’s try. Jimmy Bowen’s great try-making run is shown next, and Seamus Dennison’s crunching tackle on Stu Wilson which was felt by everyone in Thomond Park, also features. Above this, the All Black Haka is performed before the game. The other Munster players, Captain Donal Canniffe, Greg Barrett, Colm Tucker, Moss Finn, Seamus Dennison, Donal Spring, Larry Moloney, Gerry McLoughlin and Coach, Tom Kiernan are also depicted. This All Black side had high hopes of going one better than the great Kiwi side of 1905 who had been beaten only once on tour. Munster, by being the only side in 1978 to beat them, prevented them from achieving this rare distinction. Munster played themselves into Irish and world Rugby folklore forever. Tony Ward showing his auctioneering skills some time ago when one of these signed Prints went ‘under the hammer’ at the Glenstal Abbey School fundraising event in the Shelbourne Hotel. Les White (Munster Prop, 1978), displaying that special Munster Cap. At a recent showing of the play ‘Alone It Stands’ in the Barbican Theater in London, in aid of The Irish Hospice Foundation, Les was asked to draw the raffle ticket to secure one of these Signed Prints for a member of the audience. He duly obliged, and to prove that he’s still a winner, drew his own ticket from the hat! Les immediately offered the Print to anyone in the audience who would donate £1500 to the deserving fundraiser, and someone responded without hesitation. So the Print raised £4500 altogether on the night. Les had been the last of the team to sign for me at his home in Portsmouth in 2009, and because I had successfully obtained all signatures, I gave him one to celebrate the conclusion of a very special project. Unlike much sports memorabilia available today, this special Print comes with full verification as to the authenticity of the signatures. It is the only item in existence celebrating this historic occasion, which includes the signature of Coach Tom Kiernan with all of the players. This has been a very special project indeed. Please Note: If you are interested in purchasing one of those remaining signed prints, please email me through my Contact Page for details.